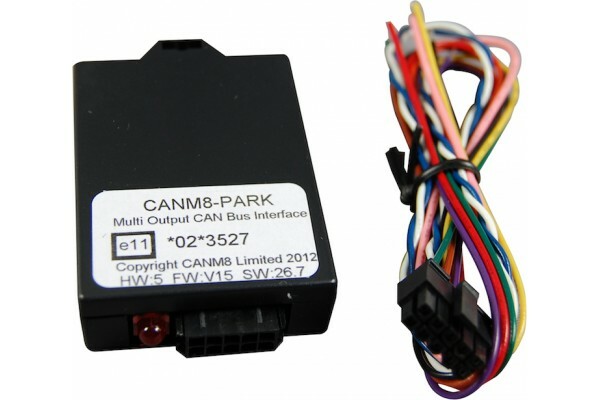 · Specifically for the use of front parking sensors from the vehicle CAN Bus, the CANM8-PARK interface provides you with two customized Speed Dependent Outputs. A controlled output of 12v is generated by the interface as soon as speed is detected. When the vehicle is roughly at 6 mph, the interface is switched off. · Some CAN Bus systems in vehicles don’t give you speed data until shortly after the vehicle is set into motion. 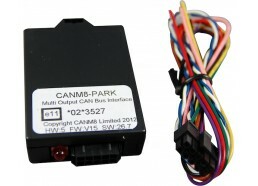 In these cases, an alternative 12v controlled output, which is always on in standby, is available. This is switched off at speeds that exceed 6 mph. · The PARK features a negative controlled output that is used to power the front parking sensor system in forward motion only. This also disables the front parking sensors when the vehicle is engaged in reverse. This avoids confusion from different tones from the front and back sensors simultaneously. · Also, to add to the two speed dependent outputs, a standard speed pulse signal is also provided and a 12v reverse gear output is available for many applications. *Available subject to individual vehicle CAN Bus support.